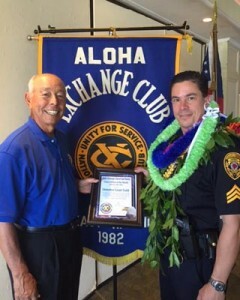 Aloha Exchange Club member Joey Estrella presents an ‘Officer of the Month’ award to Detective Grant Todd. The Aloha Exchange Club of East Hawaiʻi recognized Detective Grant Todd on Thursday (January 28) as the East Hawaiʻi “Officer of the Month” for January. Todd was honored for his role as the lead investigator in a serious of investigations that resulted in the arrest of a man considered armed and dangerous. The man was initially being sought for domestic violence. While searching for him, Detective Todd and another detective observed him driving a stolen truck. When they stopped him, the suspect fled into thick vegetation. The truck and its contents were recovered as evidence. Investigation revealed that the suspect had deployed explosive devices and that his truck might contain similar devices or materials. With the assistance of bomb technicians, a device was recovered from within the truck and rendered safe. Detective Todd took the initiative and organized the numerous cases into a manageable list. When the suspect was arrested without injury to anyone, Todd’s continued investigation led to 39 charges with bail set at $467,000. Lieutenant Gregory Esteban said Todd’s initiative and abilities made the case more manageable and efficient. “As a result, a dangerous individual was taken off the streets,” Esteban said.